With efficiency and sustainability driving the apparel industry, the process of denim and jeans finishing is taking a drastic change from its traditional method. Alternative methods of garment finishing, washing, the chemical process which will have minimum impact on the environment from denim industry have become a top priority. This article will focus on the use of Laser Technology on denim finishing which has the potential to make a change from the traditional way to something which is more modern and environment-friendly. Lasers have long been used in the apparel industry for laser marking (for surface fading), laser welding (for joining two or more layers of fabric through melting it), laser engraving (controlled cutting to a depth), laser cutting (for cutting through the fabric). It is a device that generates an intense beam of coherent monochromatic light by stimulated emission of photons from excited atoms and molecules. CO2 RF discharge excited laser source is commonly used in the textile industry which has a wavelength of around 10.2-10.8µm. With laser technology, the traditional method of discoloration, abrasion, decoration, marking, engraving, and cutting can be totally replaced. Modern laser machines are equipped with z-axis automatic up & down motion to engraves various shadowed and textured patterns with distinct layer and color transition. The process of denim finishing starts with the creation of a digital file and illustrated in such a way that the laser can interpret. With this only, the garment becomes ready for the process. The garment can be kept on a flat surface or vertically stretched for the laser to engrave over it. The technology has been able to replicate most of the wash effects with the various shade like the stone wash, mill wash, moon wash, bleach, PP spray, monkey wash, cat whiskers, snow wash, holing, tinting and so on. One video of a denim jean finishing along with laser cutting is shown in the following video. Just saying, you might get a shock. Video credit: Golden Laser via youtube. The possibilities of designs can be immense, making the wash effect more precise, uniform and defect free. The designs can be placed anywhere on the garment depending on the requirement. It is a much faster process as compared to the conventional finishing process as it is able to eliminate the need for multiple wash stages lowering production time. It can be made suitable for a wide range of materials. This process is totally environment-friendly with comparatively negligible use of water with no use of chemicals. Elimination of the various wash and finishing stages has decreased the labour and process cost reducing the production cost exponentially. Saves denim fabric from damages caused by traditional tools, chemicals, stones and bleaches etc. There is comparatively less strength loss with low hairiness as there is no forced handling required. Industry 4.0 ready as well as compatible with the traditional manufacturing process. Use of software library to easily achieve wear marks and controlled breakage on textiles with different levels of ageing effect on garments which can be reused for later times. It can totally eliminate the need for having an inventory, as any quantity of finishes can be replicated from just a laser file and a post wash also paving a way to On-Demand-Manufacturing. A laser treated denim garment can be worn instantly after the fading process as there is no change in pH value during the process. For small and medium-sized factories initial investments are very high compared to the traditional method. Skilled machine operators along with designers required. Often some designs or fading require a manual touch even after laser finish to produce a natural look, which avoids the use of laser in the first place. The use of laser technology has brought about some major changes in the industry by reducing water wastage dramatically as such as 50l of water for each pair of jeans compared to the traditional water finishing process. It has also reduced the use of the toxic and chemical substance in different stages of production, especially during treatments to achieve particular effects of jeans keeping the productivity from about 70 to 170 garments per hour. It has also reduced the rejection to 0% which previously was due to natural or manmade variations that were out of the tolerance level. For example, Levi’s has collaborated with Spanish industrial laser specialist Jeanologia for technology to digitalize the process of denim finishing to achieve their goal of zero discharge of chemicals by 2020. 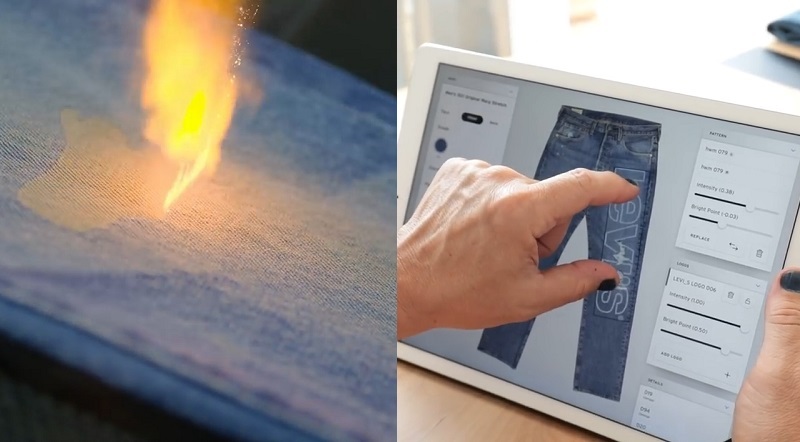 This technology has redefined the future of denim as a whole. It has also made it possible to completely sync with the concept of the green industry providing cleaner production with better chemical, waste and energy management. An introduction to laser technology for denim finishing. Its benefits and disadvantages.